The Dodgers let Matt Cain skate through a seven-pitch first inning before getting him squarely on the ropes. After scoring two runs in the second inning off a Juan Uribe bases-loaded double, to take a 2-1 lead in the game, it was a pivotal third inning which broke the game open. 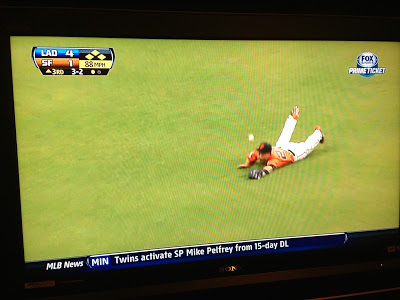 With the score 4-1 (Hanley Ramirez RBI single; AJ Ellis bases-loaded RBI single), and one out in the third inning, Uribe again came up and (be-) bopped one to Giants left fielder Cole Gillespie who made a diving attempt at a catch which was wholly unsuccessful. Ball bounces by Gillespie and rolls to the wall; bases clear and Uribe ends up on third, and "Door" Matt Cain was chased from the game with the score 7-1. Hyun-Jin Ryu knocked in Uribe in a 10-batter inning, the Dodgers groovin' high to a 8-1 lead. Uribe also got a low fastball in the seventh inning and stroked that for a two-run HR to left, giving him a career-high 7 RBI on the night and putting the Dodgers up 10-1. The Dodgers went on to have 13 or more hits for their fifth straight game. In bad news, Matt Kemp seemed to strain his left shoulder on a swing in the second inning, and worked a walk before being replaced by Carl Crawford in the third. He's got shoulder irritation. Which is better than what must be going through Bruce Bochy's stomach lining right now. Maybe Don Mattingly has some Zantac he hasn't used lately, which he could offer? Juan Uribe is a challenging post-game interview. Patrick O'Neal is really trying hard. Great job boys. Lets get EM again tomorrow! I don't think Luis Cruz is coming back any time soon. 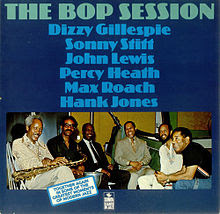 I'd much prefer Be Bop Deluxe. Mark Knopfler prefers be bop a lula. Baby, what'd I say? Remember when Cain couldn't beat the Dodgers? Then he could? Then he couldn't? Urine Cable Guy'd SF, good for him.